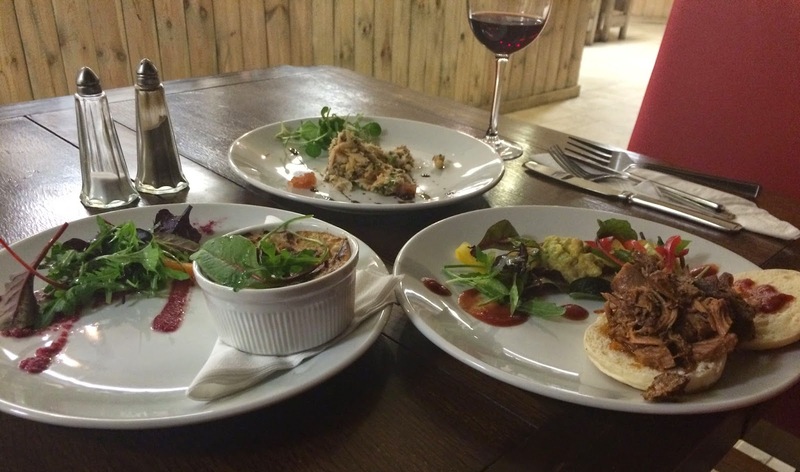 I’m sorry, but I don’t get the point of single-ingredient restaurants, which is why, despite a few readers’ recommendations, I’ve haven’t reviewed Newcastle’s Coop Chicken House. Chicken is normally the last thing I’d order from any menu, so to be offered nothing but “Whole, Half or Quarter” isn’t my idea of a fun night out. Which may be why I’ve overlooked The Sausage Emporium. It takes a particularly cold, damp January evening to instill a craving for nothing but bangers. However when my friend and I arrived at this brightly furnished archway under the East Coast line near Central Station (which make its noisy presence felt every few minutes), we realised that this is a doghouse aspiring to pedigree status. 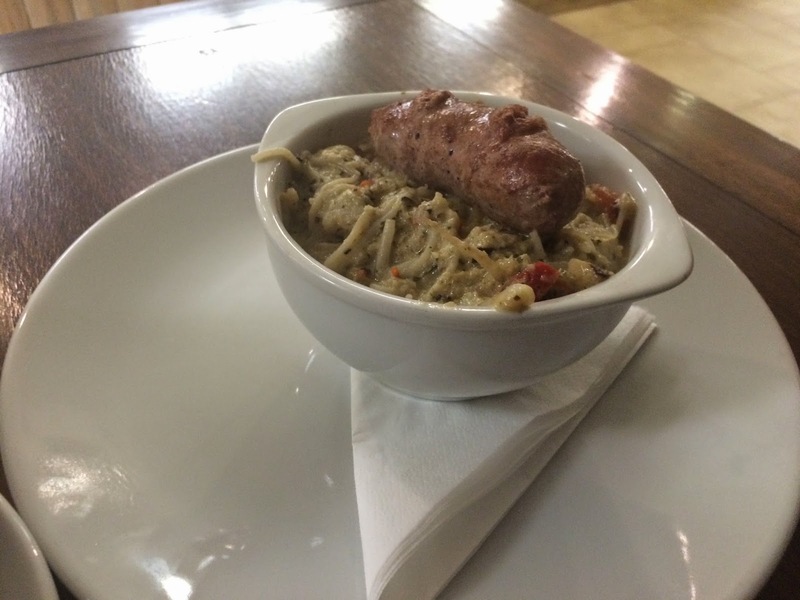 There’s a wide range of home-made sausages, from black pudding to bratwurst, merguez to vegetarian, but it also has conventional starters like cheese soufflé. We ordered pinot noir, fresh and French, while we began the important task of sausage-choosing. 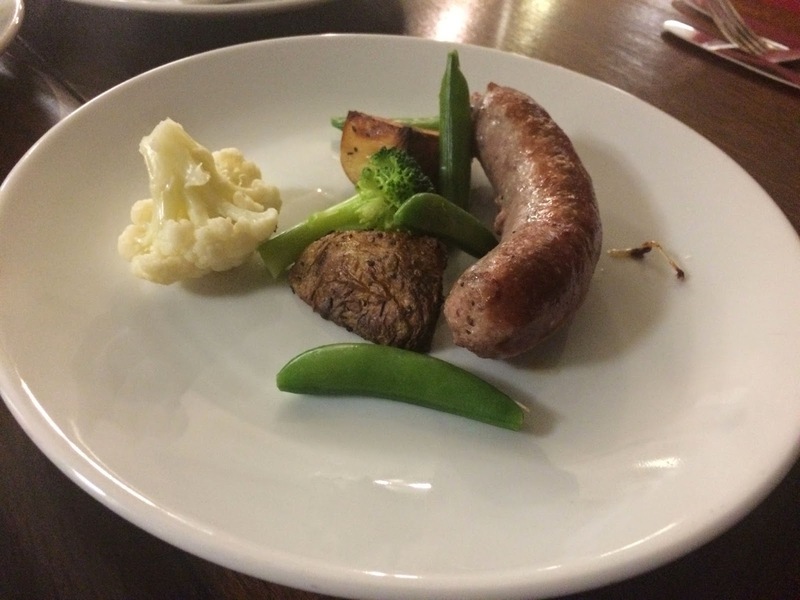 To help us, we asked the chefs, prepping away in front, to recommend their best sausage. “Triple Chilli”, was the verdict, “or Sizzling Thai”. Is the Triple Chilli very hot? we asked. “The clue’s in the title,” was the peremptory and unhelpful reply. OK, two can play at that game. 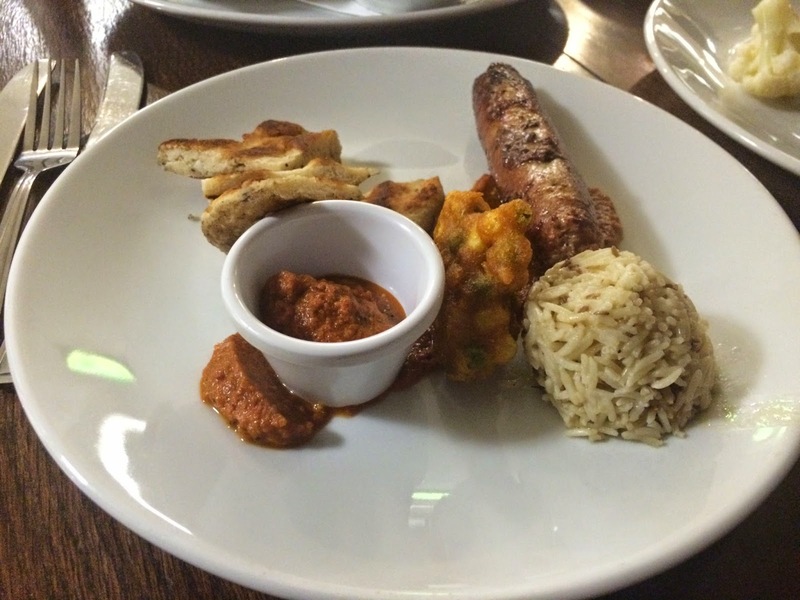 We ordered four different sausages, and three starters, just to test them. You see, the clue’s in the title. Twice-baked cheese soufflé, it read. You bake it, until it soars skywards from its ramekin, then take it out so that it holds its shape until a customer orders it, then swiftly brown it. Most chefs can do this with their eyes shut. However what arrived was cheese slop. 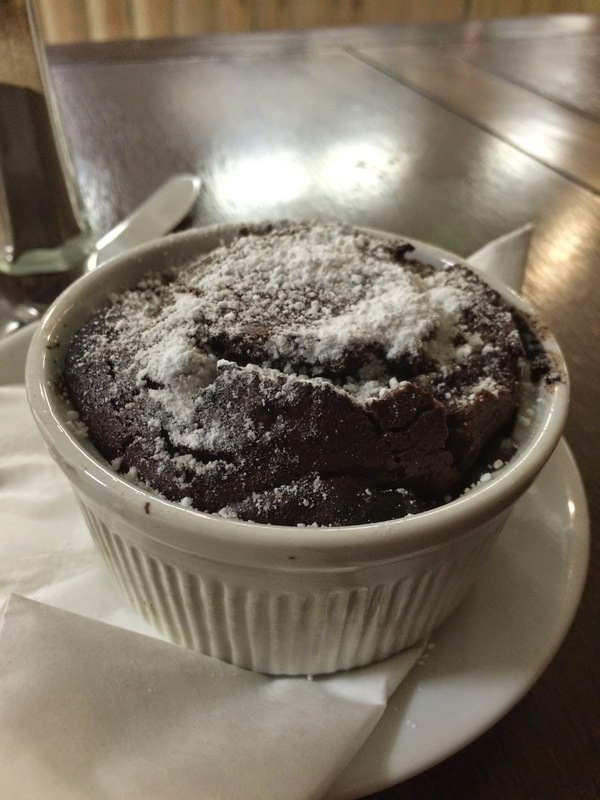 This poor soufflé had been too ashamed of its condition to even rise once above the parapet of its ramekin. 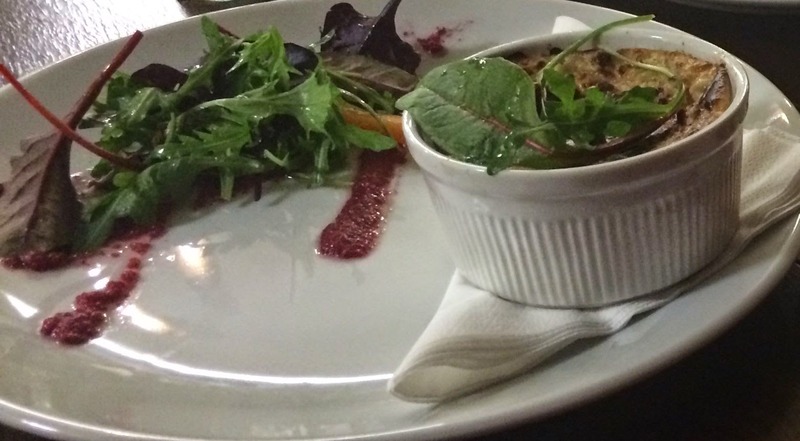 It wasn’t even half-baked, and the accompanying “beetroot emulsion” was an unemulsified smear. Sliders, an American invention that I really like, normally come in threes, because they’re so tiny and perfectly formed. This wasn’t a slider at all, though they called it one. 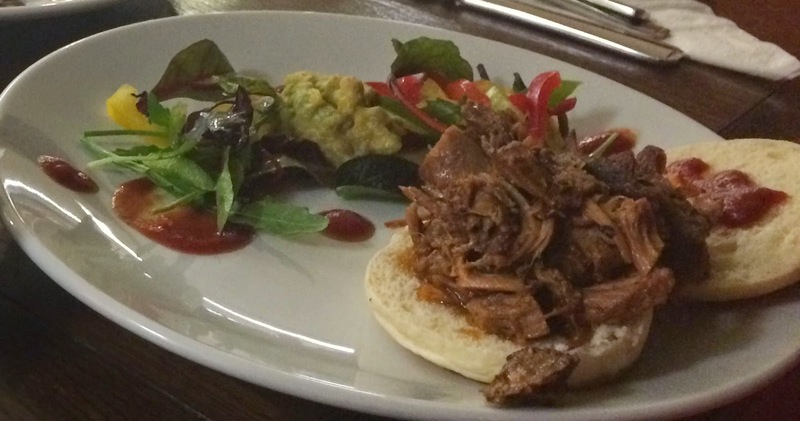 It was an ordinary bun with a squirt of ketchup on one half, and a large mound of pulled pork on the other. There was also some avocado mush they called a salsa. The pork was delicious, aromatic and moist. But it wasn’t a slider. 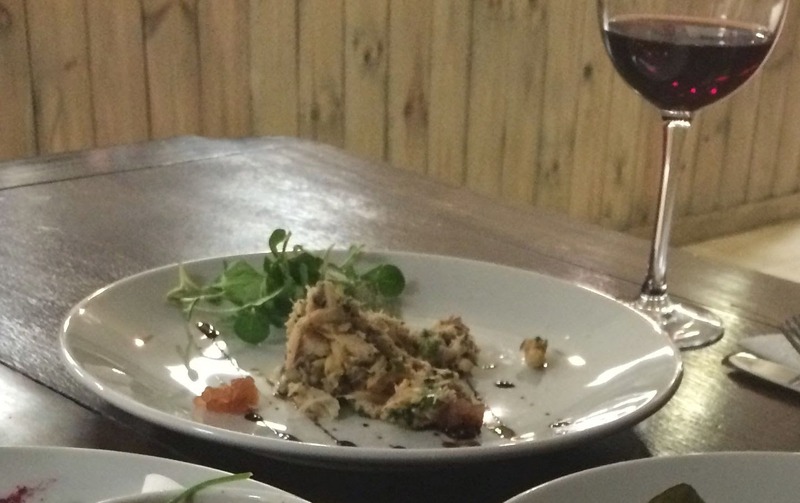 Our final starter was even weirder: “aromatic crab cakes”. What does that suggest? Fried patties with crab meat? I’ve sometimes endured crab cakes so scant of crab, they could be had up under the Trades Descriptions Act. But this was something else: cakeless crab. It was a dollop of seafood mix, nicely flavoured with lemongrass, but fashioned into nothing at all. It lay sprawling on the plate like a road accident with a teaspoon of chutney and a few leaves of watercress weeping by the side. By now our hearts were in our boots. Happily, beside our boots was redemption, in the form of Hannah the sausage dog. 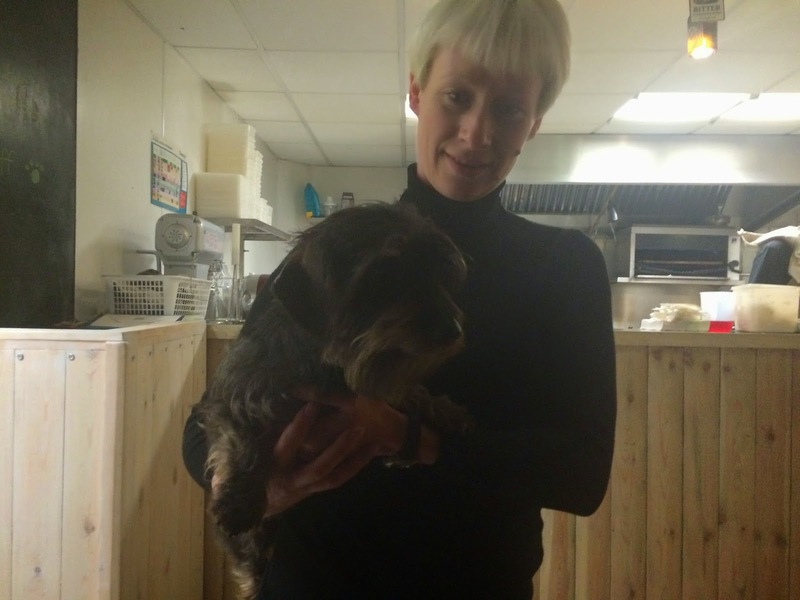 The owner’s wire-haired dachshund is six years old, and probably the best thing about this place. She’s adorable, tapping my leg every couple of minutes with her paw just to let me know she was there. The owner, a lady called Brionry Holliday, who’s married to the chef, was absolutely charming too. We hadn’t the heart to tell her about our starters. Four other dogs then arrived on the table. Three were really good, one less so. It’s clear that, when it comes to sausages, this place knows its stuff. The Onion bhaji flavour was really well spiced, and sat with a little corn fritter, though its “naan” tasted like stodgy potato bread. 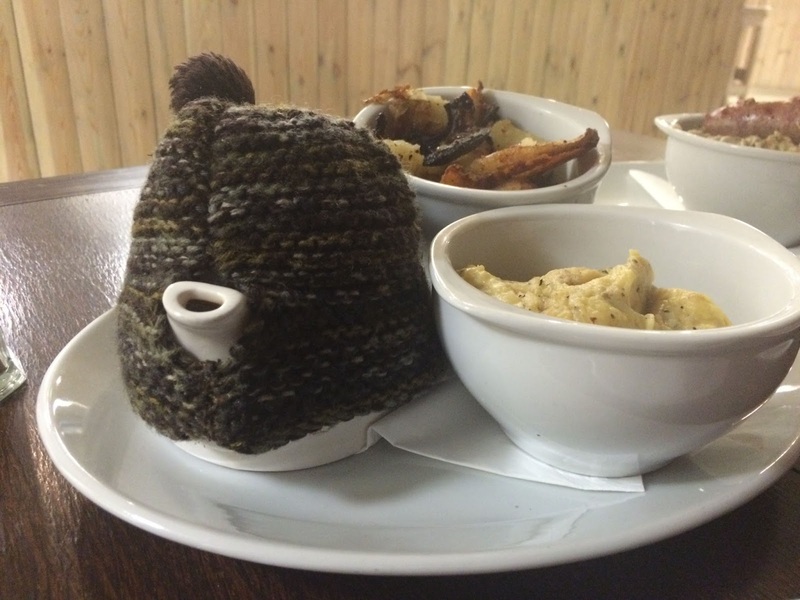 Wylam ale sausage, with very good gravy in a teapot with a knitted cosy, was also good, and came with “seasonal veg”. Well, I guess it’s the season for sugar snap peas in Guatemala. 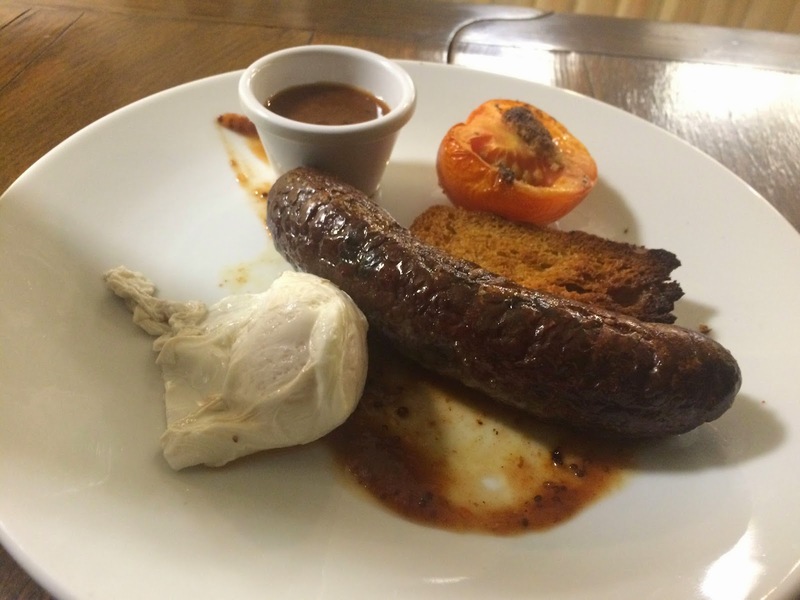 Black pudding sausage was dry, but helped along by excellent brown sauce. It came with a slice of French bread that was as hard as a dog biscuit. We’d also ordered mustard mash, which was too starchy, and what they called “traditional bratkartoffel”. Bratkartoffeln causes more obesity in Germany than any other national dish. It’s little chunks of potato, bacon and onion pan-fried in loads of fat. This emporium’s “traditional” version was like over-roasted potato wedges. Finally there was the Sizzling Thai sausage. Although I really liked the flavour, with its coriander and lime, any attempt at sizzle was snuffed out by its accompanying bowl of porridge, which was supposed to be rice noodles, but had long before descended into mush. 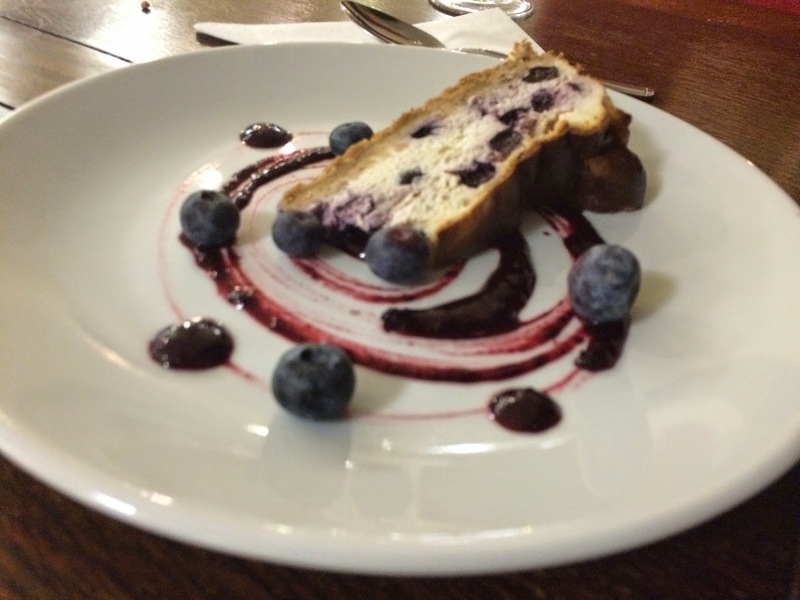 Two desserts, a good chocolate soufflé, and a cold, wet blueberry cheesecake, weren’t enough to lift this dog’s dinner of a meal above two stars. 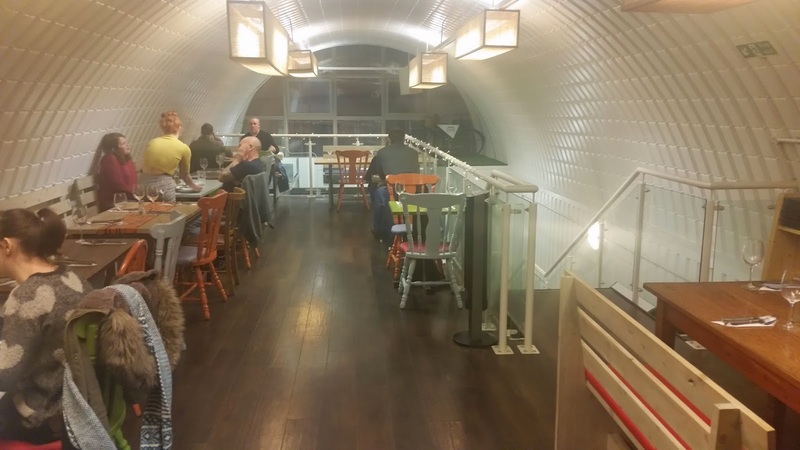 If they would just serve bangers and mash this place might be very good indeed. As it was, we very nearly gave up and headed for the chicken coop round the corner. Nearly. I actually asked if it was really hot. Which was quite a reasonable question, because the chillis listed were of different types, not all of them hot. It's like asking if a chilli con carne is very hot, or just spicy. And the person who answered wasn't a lowly serf, he was the chef/owner! A proper response would have been to answer the customer's question.
" ....I guess it’s the season for sugar snap peas in Guatemala...."
I laughed out loud ! No surprise it's now closed then!